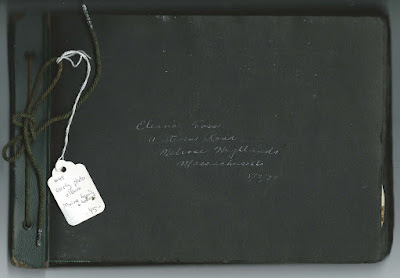 1929-1930s photograph album that belonged to Eleanor Frances Foss of Melrose, Massachusetts. 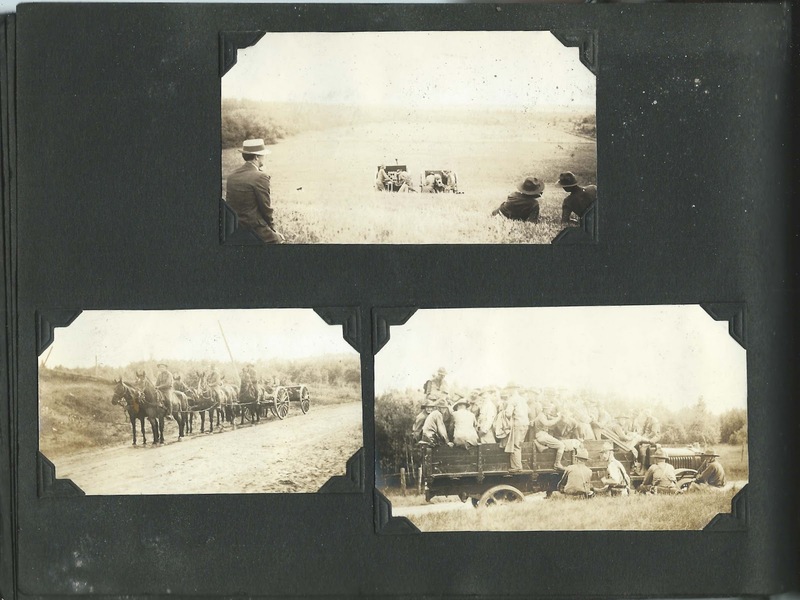 Many photographs show Maine scenes and people, reflecting the fact that Eleanor's parents were Maine natives. The album was found with an older one apparently kept by Eleanor's mother Mary Sutherland (Hinkley) Foss, a native of Alton, Maine. 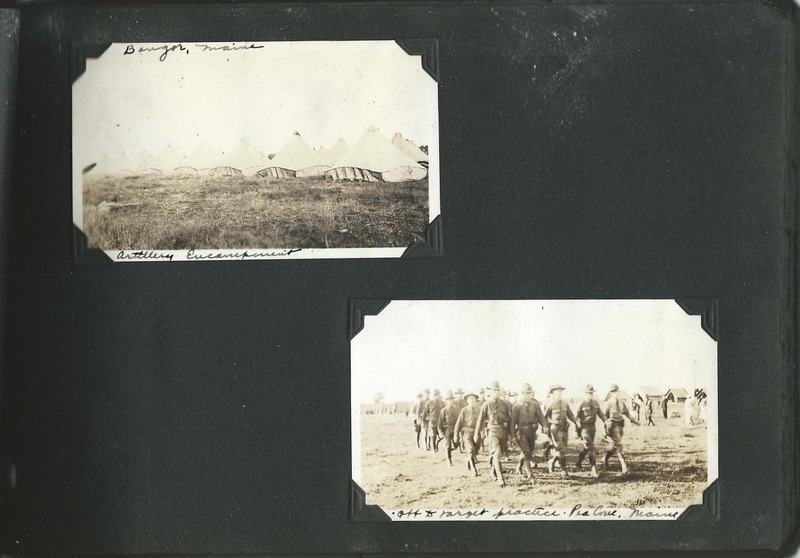 The album measures 10" by 6-1/2" and contains 168 photographs. Many of the people and scenes in the album are identified. Eleanor Frances Foss was born July 16, 1915 at Melrose, Massachusetts, the daughter of Hervey Daniel Foss and Mary Sutherland [or Southerland] (Hinkley) Foss, who were born at Hancock, Maine, and Alton, Maine, respectively. Eleanor had a younger brother Sheldon H. Foss. 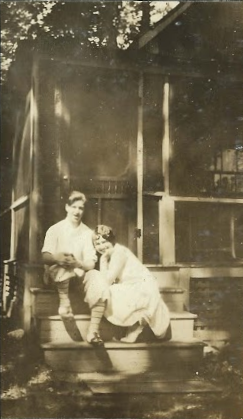 Many of the photographs depict her immediate family, as well as other family members, friends, and Paul Osman Ritchie, "Dud", who would become her husband. Eleanor and Dud were teachers. I found faculty photographs of them in the 1959 yearbook of Weymouth High School, Weymouth, Massachusetts. Dud died in 1966. Eleanor later married Henry Almon Plummer of Maine. She died at Bangor, Maine, in 2004. Her obituary details her full life of teaching, child rearing and volunteerism. 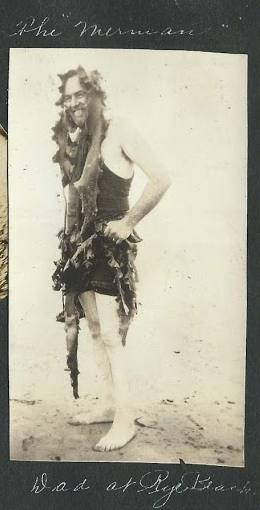 Below, a photograph that shows Eleanor's father's humorous side. 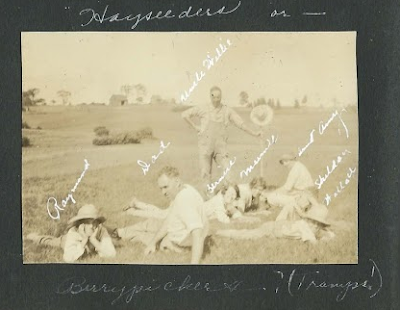 Eleanor's mother, Mary Sutherland (Hinkley) Foss appears in several photographs, but in a group or from a distance, such as in a group photo at her brother William H. Hinkley's farm, shown below. William's wife and children were Amy Alice (Malbon) Hinkley and Bernice, Raymond and Wallace. 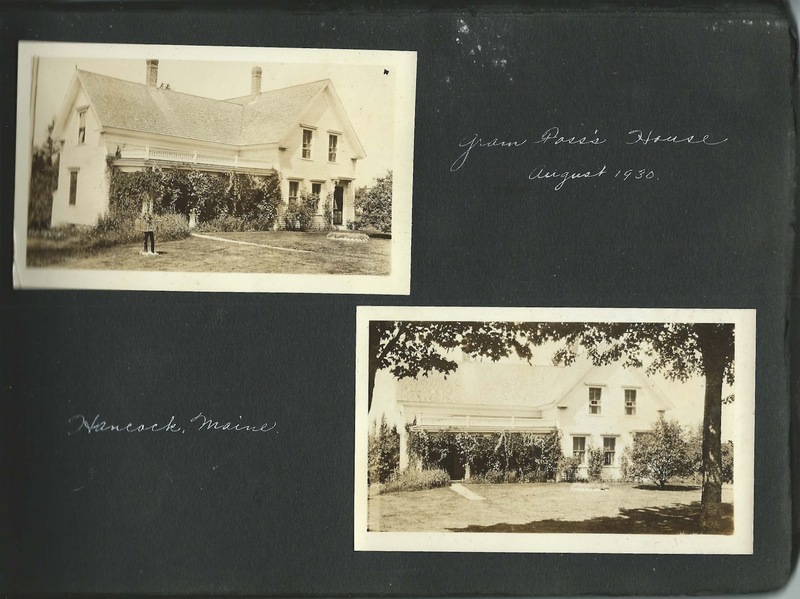 Two photographs of the farm of Eleanor's paternal grandmother, Angie N. (Springer) Foss of Hancock, Maine, widow of Augustus B. Foss. I understand the farm is still in the Foss family. Perhaps it was here that Eleanor's father, Hervey Daniel Foss, grew up. Below, two of the many photographs of Paul Osman Ritchie, "Dud", of Melrose, Massachusetts, who would become Eleanor's first husband: Dud alone and with Eleanor Frances Foss at Eleanor's family's camp in August 1930. Hancock Point - ocean scenes, vessels, etc. 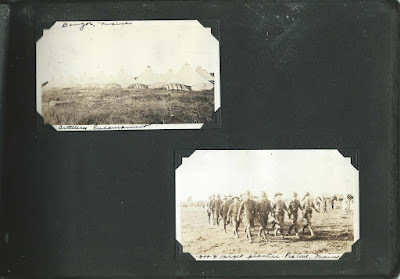 An interesting group of photographs shows military activities in the Bangor, Maine, and Old Town, Maine, area. Philip, August 1930. 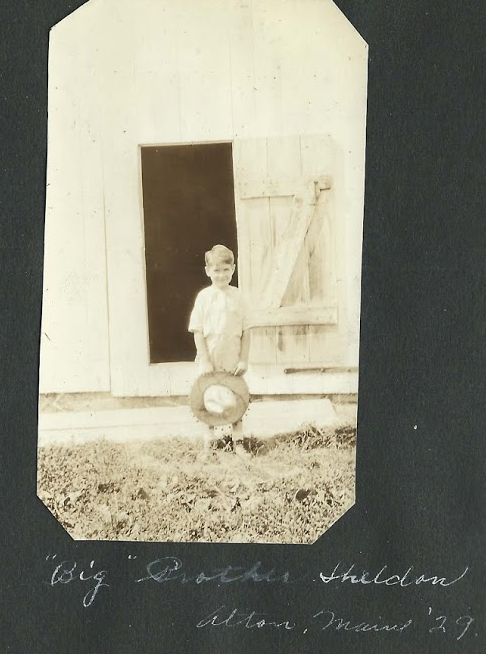 Possibly taken at the farm of William H. Hinkley of Alton, Maine. Eleanor Frances Foss of Melrose, Massachusetts; owner of the photograph album, which she started in 1929. She appears in multiple photographs as "Me" and "I"
Sheldon. He was Eleanor's brother, Sheldon H. Foss, who appears in multiple photos in Massachusetts, New Hampshire and Maine. Dad. He was Hervey Daniel Foss, Eleanor's father, who appears in multiple photos. Gram Foss - two photos of her farmhouse at Hancock, Maine. She was Angie N. (Springer) Foss, by then the widow of Augustus B. Foss. They were the parents of Eleanor's father Hervey Daniel Foss. Uncle Floyd of Skowhegan, Maine, August 1930. Floyd C. Hinckley, or Hinkley, was Eleanor's maternal uncle; in addition, his wife Sadie was a sister to Amy Alice (Malbon) Hinkley, wife of Floyd's brother and William H. Hinkley. Bernice - multiple. Possibly Bernice E. Hinkley, daughter of Eleanor's maternal uncle William H. Hinkley of Alton, Maine. In one photo, she's shown with her cousins Helen Perry and Eleanor Foss. William H. Hinkley, "Uncle Willie", Eleanor's maternal uncle. Several photographs of him and scenes of his farm. Wallace Hinkley - multiple. Son of Amy (Malbon) Hinkley and William H. Hinkley, who was Eleanor's maternal uncle. Helen - multiple. Helen Perry, daughter of Eleanor's maternal aunt Blanche Mildred (Hinkley) Perry. In one photograph, she's shown with her cousins Bernice Hinkley and Eleanor Foss. Wendell Potter, January 20, 1929. He appears in several photographs. Dud Ritchie, June 17, 1929. 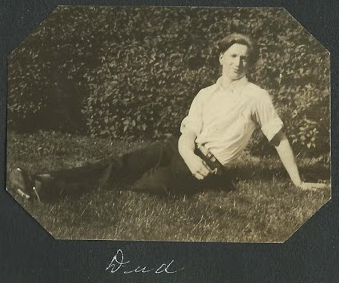 Eleanor's future husband, Paul Osman Ritchie, "Dud" (1913-1966), of Melrose, Massachusetts, a 1931 graduate of Melrose High School and appears in many photographs. Newton Woodbury at Plum Island - appears in other photos as "Newt"